+1.25V to 15VDC @ 0.25A. -1.25V to -15VDC @ 0.25A. High impact molded case 2"(H) x 11"(D). With flow-thru cooling to ventilate the power supply. 1 bredboard, 830 tie points including two bus strips. Two no bounce logic switches. Clock frequency 1Hz, 1kHz, 100kHz, 60Hz. Clock amplitude 5Vpp square wave. 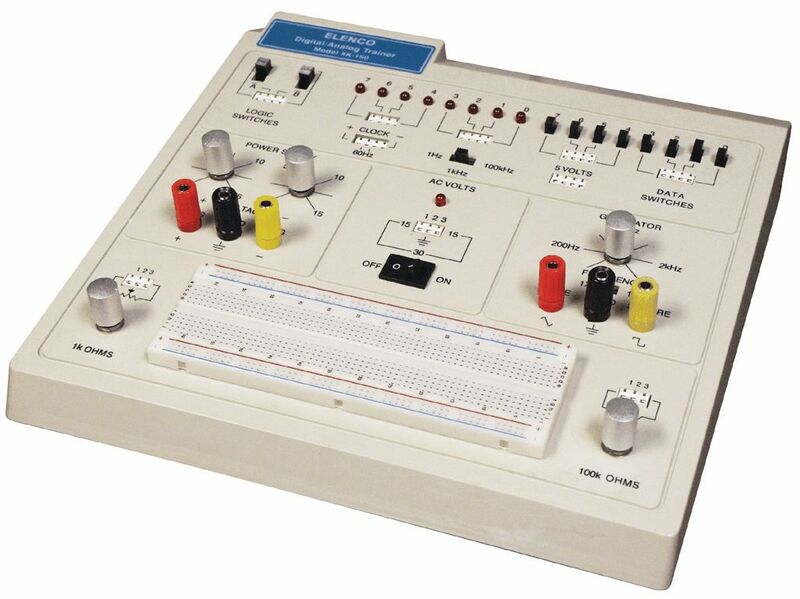 Function Generator - Sine, Square Wave. Frequency adjustable in two ranges from 200 -40k. 2 undedicated potentiometers 1kΏ and 100kΏ. Model XK-150K Digital Trainer, a kit version of this product is also available, please Contact us to order. An economical zipper case is also available. Two Channel USB PC Oscilloscope, 2 x 60MHz - NEW PRODUCT!